Hallaig - the lost village of Raasay - is a powerful place. Arguably, it has become a shibboleth for the soul of Gaelic culture. To visit it, to just be there momentarily and feel the resonance of the place, is to know the fragility of place and home, of how kinship can be shattered and how loss can invade a land. Aptly, Hallaig is now a site of pilgrimage for those who value the universal lessons of history. There are terrible reasons for the loss of Hallaig. Its silent mouths of abandoned shielings, the dumb sheep meandering amongst the ruins, whisper with Sorley MacLean's poetry. The place misses the sounds of day-to-day community, and all around the woods and burns and slopes this tough but rich landscape once made this a hardy paradise under the eastern cliffs of Raasay. Facing east to the dawn and overlooking the peninsula of Applecross and the berry-dark depths of the Inner Sound, the walk to Hallaig leads quietly along a broad walkway under Beinn na Leac to the southern promontory of Rubha na' Leac, from where a series of dramatic Jurassic sandstone cliffs and headlands diminish to the northern shielings of Screapadal, where the story of Hallaig is echoed painfully. Hallaig was named as a Norse settlement, the 'holy bay', but it would have been a fertile patch of land long before that and medieval run-rigs suggest earlier habitation. Standing by the dedicatory cairn to Sorley MacLean, the broad sheltered bays lap up against steep cliffs. Burns tumble off cliffs into the ocean in great white horse-tails. Perched above the cliffs and slopes are the greener swathes of the farmed land, surrounded by thickets of alder and birch. Hallaig is first named in print in a charter of 1596, specifically as a place of human settlement. By 1846 there was a total of 28 recorded houses around Hallaig but by 1871 there is only one shepherd and his family recorded*. What happened in the those few decades is a tale told all over the Highlands: land cleared for the 'new economy' of sheep farming, while the famines and potato blight of the 1840s added to the exodus. The feudal estate system and its imbalanced powers of laird and tenant allowed for the easy de-patriation of lands and expulsion, what we would now call ethnic cleansing. The reasons for doing so were couched in the blase terms of 19th century popular economics, ignoring both natural and human ecologies of place for a blanket profit system. The argument for the clearances can be understood in almost every case as a decision of economy by empowered individuals rather than communities. The older chief/clan system which valued kinship and its support (especially in times of war) could easily be transitioned to a more selfish laird/tenant relationship where the exploitation of the feudal land rights became more profitable than the idea of maintaining community. To understand the harshness of this land, the rugged walk from Fearns to Brochel Castle, along the eastern coast of Raasay, takes around seven hours of hard negotiation with vegetation, rocks, gorges, burns, tidal shores and steep slopes. The first part of the walk, from the road-end at North Fearns, leads along the pleasant access track of An Leac, along which so many disappeared would have walked to and from Inverarnish and Clachan. The sunny track, under canopies of old willow and rowan trees, leads to the headland of Rubha na' Leac and allows the first spectacular views north along the Jurassic cliffs of eastern Raasay. A cairn to Sorley MacLean subtly announces the territory of remembrance that lies ahead. Ahead, in the silent lee of larger cliffs, the Hallaig burn tumbles noisily off a headland upon which birch, alder and hazel woods cling to crumbling cliffs and gorges. The path darkens and weaves past a silent ruin and on through trees tattooed with vibrant green lungwort. After crossing the burn the path weaves through a patch of coppiced birch, then opens out onto faint run-rigged slopes now matted with sheep-bitten turf. A walled sheep enclosure, which was built from the evacuated ruins of the Hallaig homes, forces you up and around the slopes to the remaining evidence of older communities. One particular complex of shielings, tucked into a sheltered mezzanine under the 'pass of Hallaig', showcases the architectural subtlety of the homes. Each house has a low wall to support now-vanished thatch roofing and at each corner the walls curve with dense rounded dyking, with an intricate jigsaw of carefully-selected stones, echoing an era of skill and care and kinship with the environment. The older natural laws of living on the land are built intrinsically into this fabric and there are no modern scripts on ecology and sustainability more telling than a Hallaig stone wall. Further past the ivy-choked gullies of the ridge above, old run-rig patches disintegrate into the boggy stretch of Loch a' Chada Charnaich under the distinctive cap of Dun Caan, Raasay's highest point and geologically the youngest (a new hat on a very old head). A north-flowing burn of sweet soft water is a good spot to fill canteens and bottles.The burn leads down to the fossil-sandstones of the shoreline, where refreshments for the next phase should be taken. What lies ahead is a strenuous and sometimes claustrophobic walk under spectacular cliffs encrusted with what could only be called 'vertical Atlantic rainforest'. Hours are lost tracking the best way along this shore, occasionally on the tideline, occasionally embedded in bracken, boulder-fields and treacherous gullies. 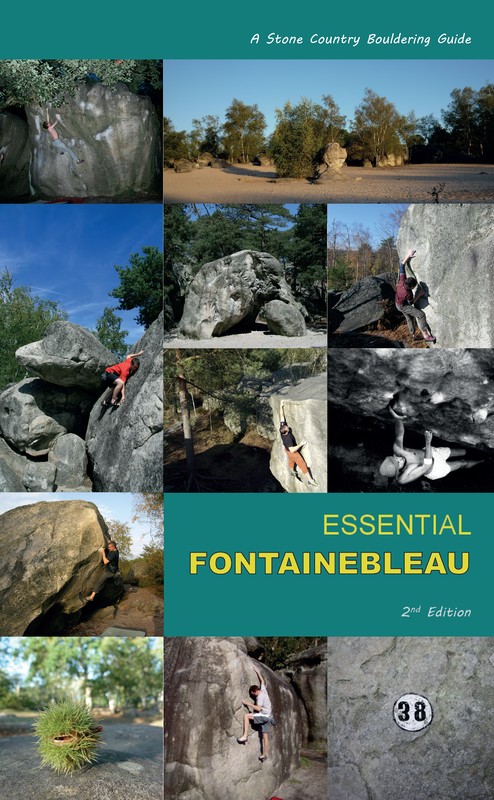 It is a struggle to make any headway in summer and best considered out of bracken-season. High above, the remarkable architecture of the pinnacles and cliffs echoes to the cry of both Golden and White-tailed Eagles, and the flora continually surprises with patches of primitive spore-spread flora such as ferns, horsetails and spleenworts. The sandstones on the shore are imprinted with Jurassic scallops, squid and tubeworms, and the sudden thump of heavy dinosaurs would not be a sound amiss amongst this ancient landscape. Eventually the giant boulder-field south of the Screapadal ruins is met, with easier sheep-paths meandering into the fertile slopes of the older community lands north and south of the An Leth-allt burn. The largest boulder by the shore, with a caved underbelly, is known on the map as An Eaglais Bhrèige, which translates roughly from the Gaelic as 'the false church'. This is based on old folk-tales of Taghairm or pagan ceremony, easily appropriated as 'devil-worship'. 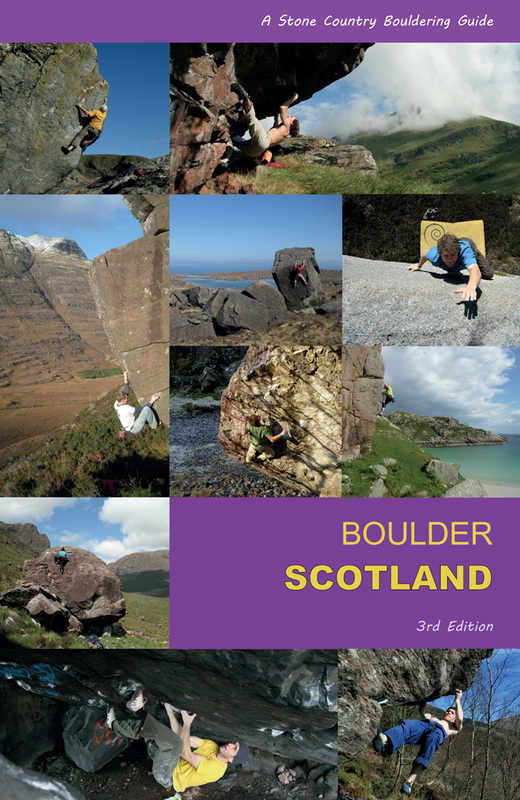 The boulder cave does form a natural arch and altar and is now home to a hard bouldering rock climb by Scotland's most prolific modern rock climber Dave MacLeod, in the ancestral land of MacLeods, and very much a performed mark of respect, a tip of the hat as it were. Modernity creeps back into the walk with mariner marker poles and spruce forestry, leading to a a landrover track back to the base of Calum's road and Brochel castle. Leaving a vehicle or bike at either end of this walk is a piece of advice worth taking, as the return to Inverarnish is a tale of weary feet, even if the mind is lightened and enriched. the dead have been seen alive. 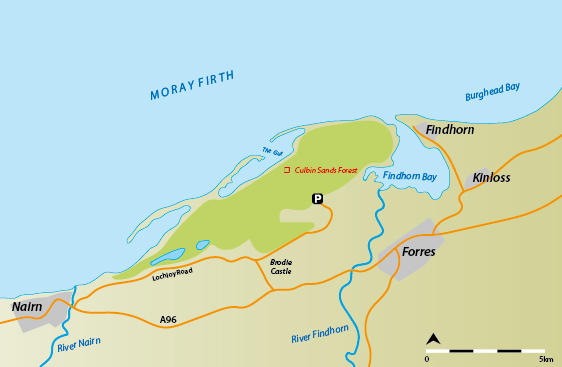 The Moray Firth’s sand-bitten southern coast, between Findhorn and Nairn, is home to Scotland’s most cautionary tract of land. Now a wilderness of maritime forest, dunes, salt marsh and spits of sand, its human history has been dated to the Bronze Age, around 1300 BC, but it is a territory that since glacial times would have been mobile and mutable. The Laich of Moray is the fertile strip of plain squeezed between the foothills of the Cairngorms and the Moray Firth’s south coast. In Gaelic it is called Machair Mhoireibh (the machair of Moray), a perfect habitat for golf courses and rich arable farmland, threaded by the glacially-rivered straths of Nairn, Findhorn and Spey. Culbin is an old parish which is now buried under 28 square kilometres of duneland and recent forestry. 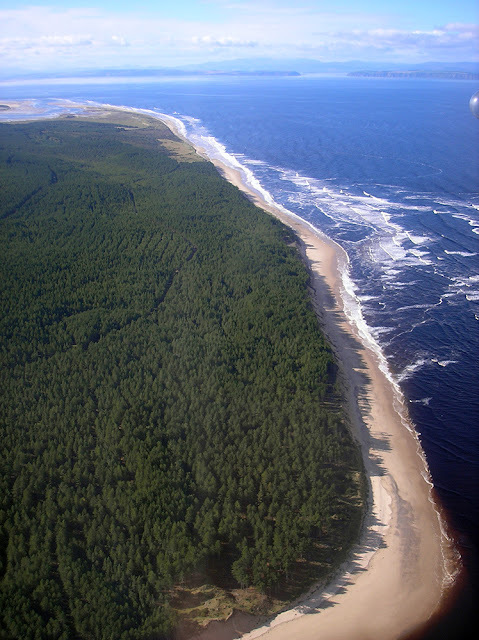 Sweeping east of Narin and curving in to rise up to its greatest heights above the estuary of the River Findhorn, it is now managed by Forestry Commission Scotland, but it is notable that this is a humanly retrieved territory, planted on a wilderness of sand which swarmed over once-rich arable land in an environmentally chaotic 17th century, leading to the abandonment of the Kinnaird estate. The key event came in 1694 when farmers abandoned their fields as a sudden westerly sandstorm blew in on an autumn gale during harvest. Within days the marauding sand had buried the bulk of the estate, further diverting the River Findhorn to flood the blocked land. 19th century historical accounts, when the land was still a wilderness of dunes, say the storm was ruthless, ‘sparing neither the hut of the cottar nor the mansion of the laird’. The fields and orchards of the estate were buried, as was the mansion house of Alexander Kinnaird, its chimney finally appearing from the sand a century later. Stories tell of locals spooking themselves with their own echoes when they shouted into the chimney. The sand storm of that autumn, and the years hence, was no accident of nature, but a typical and salutary result of hubris mixed with simple desperation. Destabilisation of the older duneland was a slow and inevitable result of human hands: machair turf was ruthlessly stripped for house building; heather and marram uprooted for thatch and bedding. Nairn council banned the practice in the 1660s but evidently this had little effect. This was a time of famine, long winters, rain and wind and failed harvests. Now Culbin Sands is a quieter place, its echoes muted by the dense forest, the pine needles and moss insulating its historical anguish. 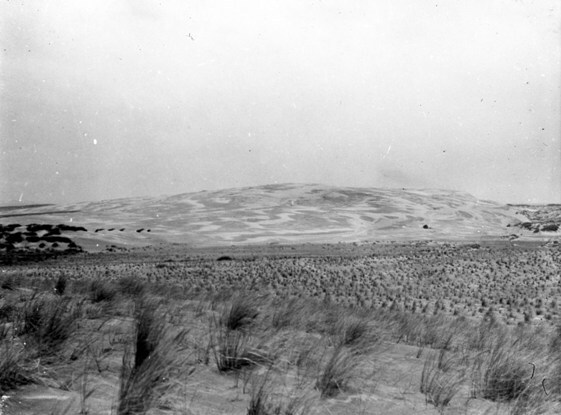 The sandy waste, once referred to as ‘Britain’s desert’ and carpeting over 3,500 hectares, is now a fine canopy of Scots Pine, Corsican Pine, and birch (when viewed from the lookout tower of ‘Hilltop 99’). In the nineteenth century a program of stabilisation and reforestation began. By 1900 around 1,200 hectares had been planted, using a stabilising system with marram grass and surface thatching and this continued between the wars. The forest was then felled for the resources required for the Second World War - many of the pine trunks can still be seen embedded in the sand in ‘The Gut’ marshes, to deter the landing of enemy aircraft. The Forestry Commission resumed planting and by the late 1960s there was over 2,500 hectares under plantation. Today, a discreet brown tourist sign for ‘Culbin Sands’ points north from the busy artery of the A96 between Forres and Nairn, and into a vast and unexpected forest. Geometric arable fields, studded with hay bales and rolling combines in September, suddenly abut a dense wall of dark green pines, shielding a curious and cautionary tale of the embedded impact of humans when the climate turns. Something feels odd about stepping into a pine forest swirled and bedded with sand. Biblical warnings come to mind and a quick googling of the history of the place brings up images of a black and white Victoriana of a quite different character: figures photographed stepping up dunes of sand as though post-carded from the Sahara, the odd wisp of marram grass punctuating grand curves and parabolas of nature’s rule of change and mobility. Now, the car-park maps suggest trails through this sandy-footed maze of vertical tree trunks, gridded plots and straight path lines, its crossroads numbered, thankfully so for the wanderer seeking the way home. It is a wilderness of order and easy to lose one’s bearings in its repetition, and the forest hides any sightline and muffles any directional sounds. The old parabolic curves of the historic sand dunes are lost to time amongst the new forestry, but can still be apprehended in parts where small landslips show bellies of ochre sand under a painfully thin skin of pine needle humus.